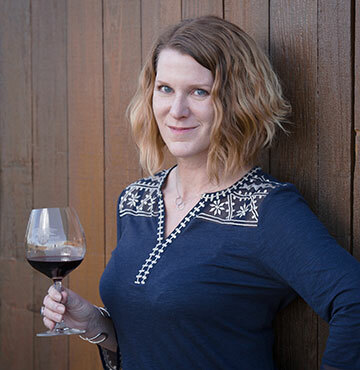 If she weren’t a vintner, Chris would like to be a travel writer or a surf bum. A love of wine led me to a harvest with the ultimate Pinot Noir geek (Ed Kurtzman), then back to UC Davis for the second time. A 1974 Stags Leap Wine Cellars SLV Cabernet Sauvignon. I had the pleasure of working with Erin Green at Pahlmeyer. In addition to having a phenomenal palate, she taught me that “work hard, play hard” is a terrific philosophy. I get to see the entire life cycle of a wine - from bud break through the growing season, into the cellar for fermentation, as it matures in barrel, then into the bottle and throughout aging. And it is immensely rewarding to work with an incredible team who makes it all happen! Mother Nature, and equipment failure. To make a memorable bottle of wine, many areas of excellence are required, from your growers and fruit, to your cellar team and equipment. Each person who touches this process must bring a ‘no compromises’ mantra to their piece of the puzzle – this is what cultivates excellence in the bottle. We live and breathe grapes and wine, but also live on this dirt, breathe this air, and drink this water. We are committed to sustainable and fish-friendly farming, water conservation, our beneficial insects/birds/critters in the vineyard, and a focus on green vineyard and winery standards. I’d be a travel writer, or perhaps a surf bum. Leonardo da Vinci, Pablo Picasso, and my granny. Throw yourself all in – don’t dip your toe in the water, do a double somersault off the diving board. People who are committed and giving every ounce of themselves will always make it here. I’m addicted to popcorn and champagne. Don’t dip your toe in the water, do a double somersault off the diving board.